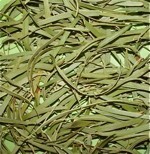 A bush herb that forms an important part of Aboriginal bush medicine stories. Can be made into a tea, then stored in the fridge to drink daily. Ground and put into capsules. The dried leaves are very bitter to taste and if taking for medicinal purposes it's best to discuss with your doctor first. Gumbi Gumbi Pittosporum angustifolium is a small weeping tree growing in inland Australia. Common names include Weeping Pittosporum, Butterbush, Cattle Bush, Native Apricot, Cumby Cumby, Meemee and Berriga. An important Bush Medicine plant and know by Aboriginal people for generations as a cure-all.